Then close your eyes and feel your hand. You do not imagine the pain. This misnomer you must disprove. Now try using your other side. The pain returns, who is to blame? When something that once was has gone? 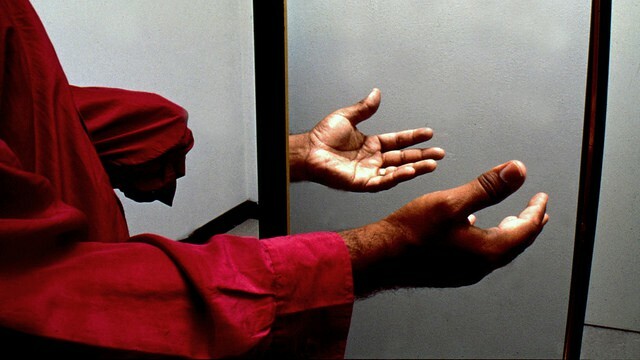 A phantom limb mirror (Photo Credit: Golan Levin). This is a pantoum, based on recent research that has identified the cause of phantom limb pain. Phantom limb pain refers to ongoing painful sensations that seem to be coming from a part of the limb that is no longer there, and it is believed that between 50% and 80% of people who have had an amputation suffer from this form of chronic pain. Until recently it has not been entirely clear what the cause of this pain is, but researchers have now identified the cause as being a ‘reorganisation’ of the wiring of the brain following the loss of the limb. By using a Brain-Machine Interface (BMI), the researchers were able to train people experiencing phantom limb pain in a missing hand. The participants of the study were able to control a robotic hand using their brain, and the researchers found that when they used the part of their brain that was usually associated with the missing hand then they experienced an increase in pain, but that if they used the other side of their brain (i.e. the part of the brain that was associated with movement in their remaining hand) then the pain subsided. For example, with people that were missing a left hand, if they used the part of their brain associated with movement of their left hand to move the robotic hand then their pain increased, whereas if they used the part of their brain associated with movement of their right (remaining) hand then the chronic limb pain was found to decrease. This study indicates that robotics and artificial intelligence may provide a solution to phantom limb pain, with engineering being used rather than drugs. However, whilst the results are promising, the researchers note that the effects are temporary, and that they require a large, expensive piece of medical equipment to be effective. They are hopeful that a treatment based on the techniques used in this study could be available within five to ten years. I don’t have phantom pain. But chronic pain. I imagine it to be similar in the sense I have no injury… the brain is just sending a signal to feel something on repeat. I enjoyed that piece. Great poem. Thank you Nikki, I think that is a really apt description. I hope that you manage to find some help to ease your own pain.